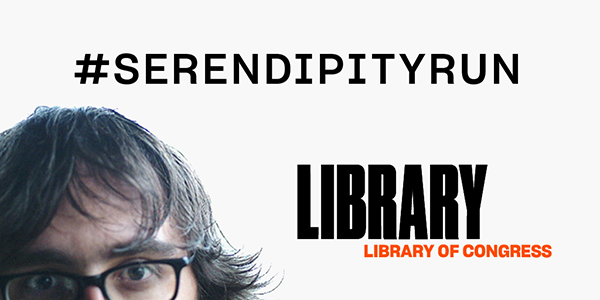 #SerendipityRun is an experiment in collaborative serendipity. During the run, we’ll see how far and wide we can range across the Library’s vast collections, riding waves of whimsy, curiosity, and chance. On November 8, join an all-star cast of artists, writers, curators and Library staff as we explore the endless sea of possibility that can be found in the Library! The run will kick off from the @LibraryCongress Twitter account. Follow the activity using the #SerendipityRun hashtag. During the run, if someone tweets an item from the Library’s collections that connects with you, look at the item on loc.gov. What did the item make you think of? Does it remind you of something or make you curious to find other content? If you find a new item that interests you, tweet that item using the #SerendipityRun hashtag and share your story. Be sure to add the loc.gov link and attach an image, so others can use it as a jumping-off point for their discovery. Learn more and join the conversation. We bet there are some wonderful Wyoming items in the LOC collections.